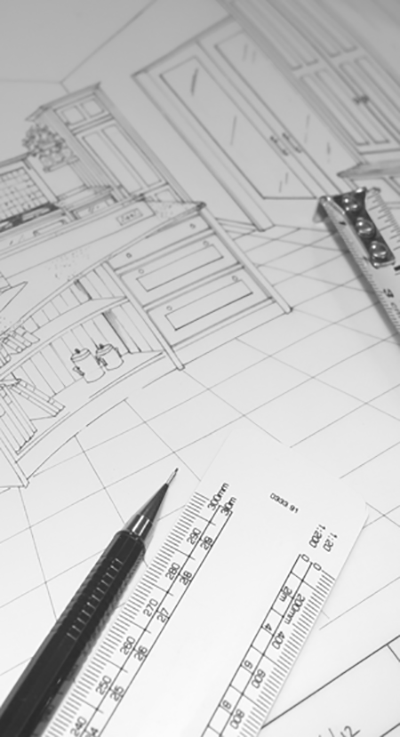 At George Robinson Kitchens, we are committed to designing and creating a beautiful kitchen that will complement and enhance the style of your home and your life. George keeps the customer at the centre of his experienced and personal service. With his team, he undertakes the complete process of creating truly beautiful bespoke kitchens, from initial consultation and advice through the design, manufacture and installation stages. Appliances and work surfaces are ordered and fitted to your satisfaction. Whether you choose a classic, contemporary or avant garde kitchen, our knowledge, experience and craftsmanship can create a unique, practical and beautiful space for you. “My designs are influenced by various factors, but the most important first stage is to talk in detail with prospective customers to find out as much as I can about what they need and what they would like within their living space, and the style of furniture that appeals to them. Sometimes they have collected images before contacting us, or they may have seen something on our website or in our brochure that has fired their imagination. I also ask about their lifestyles – whether they enjoy cooking, if the living space is a family area, or whether they have a wish list of features. The environment in which customers live also gives me information about design possibilities. Is it an old house, a cottage or a period property, or even – as has been the case on three recent occasions – a castle? The customer’s taste in furnishings and interior design will itself provide me with fruitful ideas. Even the surrounding landscape can also be an influence on the colours and shapes of features within a kitchen – in Cornwall, of course, the predominant influence is the sea. As I am myself a keen cook, I look closely at the functionality of the design. It may sound just like common sense, but siting a dishwasher close to the sink, storage cupboards and crockery drawer also saves time! Similarly, it is really important to make sure that the interior of a larder unit has features such as a slate cooling shelf, for those who love to make jams and chutneys, and vegetable baskets, for those who have an allotment and grow their own. We offer customers a complete package in terms of helping to choose and source appliances, fixtures and fittings and worktops, and can make recommendations about the products that we use to hand finish our furniture. We can also advise on other interior features such as lighting and are happy either to recommend contractors or to work with those engaged by the customer.